The gong frame is easily assembled by sliding the legs into the sockets on the end plates, then sliding the leg/plate assemblies onto the 1” diameter support shaft. No tools are required for these steel gong targets and the legs can be positioned to provide a stable unit on uneven ground. The frame can be easily disassembled for transport in your vehicle. The support shaft is 30” from the ground to provide clearance for larger targets, like the 18” diameter gong. The chains are bolted to the steel targets with ½” Grade 8 hardened carriage bolts, hardened washers and locknuts and the height of the target is easily adjustable by sliding any link of the chain onto sturdy hooks which are welded on the support shaft. All hardware is supplied with the frame to mount the steel gong target. The gong targets can be used with all handgun and most rifle calibers. The gong shooting targets are made from AR500 hardened steel for extreme long life and excellent impact resistance. Minimum range is 15 yds for handgun and 100 yds for rifle use. Maximum velocity at impact is 3000 ft/sec. Custom Metal Products is the premier source for pistol targets and rifle targets. Gong Frame 8" Gong Target Shipping weight: 42 The gong frame is easily assembled by sliding t..
Gong Frame 10" Gong Target Shipping weight: 41 lbs The gong frame is easily assembled by slid..
Gong Frame 12" Gong Target Shipping weight: 47 lbs The gong frame is easily assembled by slid..
Gong Frame 16" Gong Target Shipping weight: 59 lbs The gong frame is easily assembled by slid..
Gong Frame 18" Gong Target Shipping Weight: 62 lbs The gong frame is easily assembled by slid..
For Gong targets up to 24" high Shipping weight: 34 lbs The gong frame is easily assembled by ..
For Gong targets up to 36" high Shipping weight: 45 lbs The gong frame is easily assembled by ..
For Gong targets up to 48" high Shipping weight: 80 lbs The gong frame is easily assembled by ..
8" diameter gong target Made from 3/8" thick AR500 hardened steel for extreme long life and exce..
10" diameter AR 500 gong target Made from 3/8" thick AR500 hardened steel for extreme long life an..
12" diameter gong target Made from 3/8" thick AR500 hardened steel for extreme long life and exc..
16" diameter gong target Steel gong for sale is made from 3/8" thick AR500 hardened steel for extre..
18" diameter gong target Made from 3/8" thick AR500 hardened steel for extreme long life and exc..
24" diameter steel gong target Gong shooting target is made from 3/8" thick AR500 hardened steel fo..
36" diameter metal gong target Made from 3/8" thick AR500 hardened steel for extreme long life and ..
48" diameter AR500 gong targets Made from 3/8" thick AR500 hardened steel for extreme long life and..
27" tall Ram Gong shooting target is a Full Size IHMSA/NRA silhouette, made from 3/8" thick AR500 ha..
23" tall Turkey Gong target is a Full Size IHMSA/NRA silhouette, made from 3/8" thick AR500 hardened..
14" tall Pig Gong target is a Full Size IHMSA/NRA silhouette, made from 3/8" thick AR500 hardened st..
11" tall Chicken Gong target is a Full Size IHMSA/NRA silhouette, made from 3/8" thick AR500 hardene..
49" tall Deer Gong target is made from 3/8" thick AR500 hardened steel for extreme long life and exc.. This item includes the chain and hardware necessary to support any gong target from the gong frame. 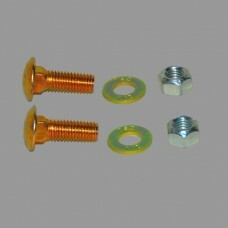 ..
Includes two sets of hardened Grade 8 carriage bolts, locknuts and flat washers. Shipping weight: 2..